A US congressional committee has voted to subpoena the White House for an investigation into a loan granted to failed solar-panel maker Solyndra. The House lawmakers voted along party lines to subpoena files and officials. Democrats called the move an overreach, while Republicans said the White House had been "downright obstructionist" to the investigation. The energy department approved a $528m (£329m) loan in 2010 to Solyndra, which later closed, laying off 1,100 workers. Republicans say the White House has repeatedly denied or delayed requests for thousands of documents relating to the loan. White House spokesman Eric Schultz said the administration had "co-operated extensively" and had already submitted 85,000 pages of documents - including 20,000 provided on Wednesday. "We'd like to see as much passion in House Republicans for creating jobs as we see in this investigation," Mr Schultz added. Representative Henry Waxman, the senior Democrat on the House Energy and Commerce Committee, said: "Apparently what the committee really wants is a confrontation with the president, not information." But Republicans on the panel said an impasse had been reached. Chairman Fred Upton said getting White House documents on the failed California firm was like "extracting a tooth without anaesthesia - painful and time-consuming". Representative Cliff Stearns, chairman of the House subcommittee, said: "The administration seems to think that if they drag this out, we will give up and simply go away. But we won't." The White House has already released emails that show some administration officials were aware of concerns raised about Solyndra's financial viability. Last week, White House chief of staff William Daley announced a 60-day independent review of the Department of Energy's loan portfolio. 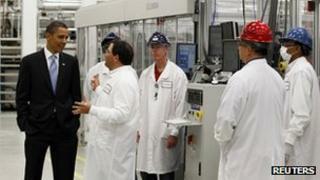 The loan was given to Solyndra under a federal programme to create jobs in innovative green technologies.